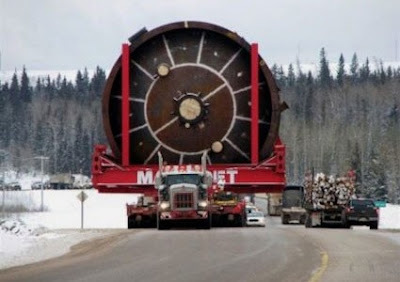 A megaload on its way to Kerl. Picture stolen from mymcmurray.com. Athabasca says it will continue moving "megaloads" through Idaho to get the facilities at its Hangingstone SAGD project up and running. Specifically they're trying to move in big evaporators which opposition groups, including the Nez Perce tribe, say clog up roads and ruin scenery. Oil sands operators like using big modules because they mean less fabrication on site, which has helped make the oil sands notorious for cost overruns. The first (of two?) shipments apparently just drove through the demonstrations along US Route 12 (a Federal highway from the river port at Lewiston to the Montana border at Lolo pass), delayed but not deterred. The next shipment is due to pass through next month. If the protesters manage to block them somehow, the shipper will have to find some alternative. The most likely seems to be what Imperial did when faced with the exact same problem, but for 207 loads from Korea: cut the stuff into smaller pieces and ship it up the interstate. Obviously, due to the much smaller scale of Hangingstone this is a much smaller issue than it was with Kerl. I think it's kind of ironic that these evaporators are being made in Port Coquitlam, a suburb of Vancouver, and then sent through the states, opening up a whole new can of worms on the way. I assume they aren't using the Trans-Canada because it's too busy and there are too many low bridges in the way. I guess it goes to show how much more built up the road system is in the US, or maybe how much more difficult it is to make good roads in the BC Rockies. Maybe if Alberta intends to continue shipping in massive industrial modules it should talk to BC about upgrading a route through the mountains. Of course I'm sure they'd face plenty of opposition from Canadian groups as well.